Now, should not only worry about security as far as accidents can go, you also have to take care of hygiene to keep your baby healthy. Make sure your pet has been dewormed. 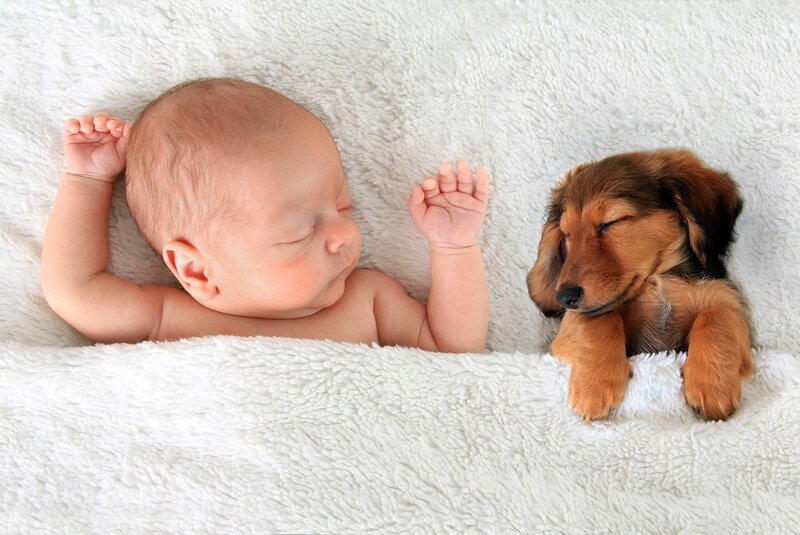 Some parasites can be passed from pets to babies, so make sure your pet has been vaccinated and is 100% healthy. Keep your pet clean. Watch out for fleas and ticks, as these can come in contact with your child’s skin. If your pet bites your little one, only scraping his skin, you can treat the manageable wound at home. Wash the cut very well under cold water and cover it with a bandage, check it the following day to see there is any signs of infection. If the wound is deep, wash it the same way but take your child to your doctor immediately or to medical emergencies. If you achieve a good bond between your little one and your pet, it will be wonderful and quite beneficial! Experts say that young children living with pets develop an excellent immune system, believed to be due to exposure to pet dandruff and some of the microbes that they carry in from the outside. There’s really nothing to worry about, as long as you’re always monitoring your baby when your pet is present and looking after your pet’s health. If you are just about to buy a dog, avoid buying a big one, as well as one bred to be a fighter or hunting dog. Instead it’s best to read many dog guides and choose a breed that is recommended for young children. Do the same with cats and choose one that can best live with infants and children.